A delicious white chocolate for Valentine's Day. February 14 approaching and the chocolate industry is prepared. So thinking about it, I decided to create this pattern. 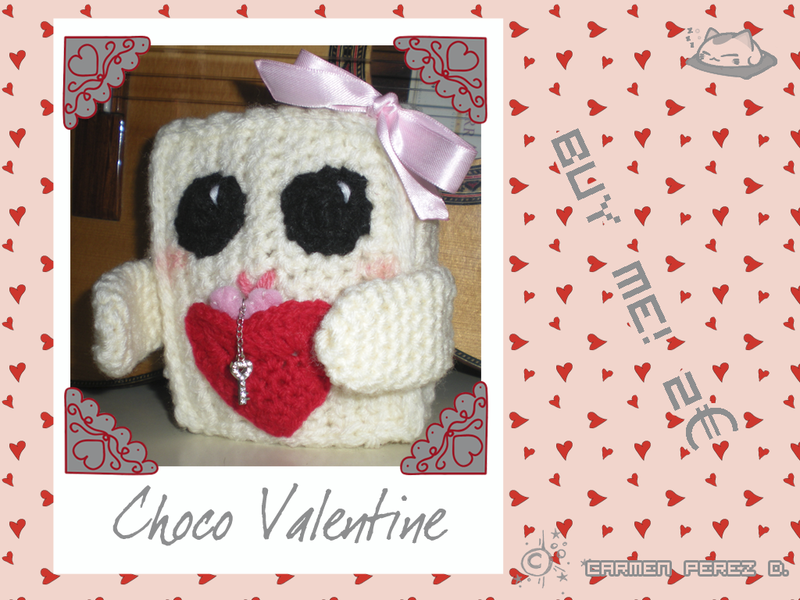 This is my first crochet pattern! ​​And like the others is easy, fast and fun to knit. I was inspired by Valentine's Day in Japan, this practice began in 1936 with Morozoff candy company.The custom is that the girls give away chocolate to the boy they like. It is a way of declaring his love for her prince gekko. This chocolate is given to the loved one is called "honmei choco" or real chocolate, and of course, the boys should respond to the girl the "White Day" which falls on March 14. You can choose what to put in that little pocket, maybe a surprise gift for that special person. Remember you can change the colors and the size to one size larger or smaller; only change the size of the needle and wool. Muchas gracias!!!! *me sonrojo >///<* Espero encontrarte por Ravelry!! !